Driving a commercial vehicle in reverse – commonly referred to as “backing” among the truck driving community – is one of the most difficult and dangerous maneuvers for a driver to make, mainly due to truck drivers’ limited visibility of their surroundings. It’s a lot tougher to avoid obstacles and keep your line of sight going in reverse. Even smaller trucks are massive vehicles relative to regular passenger cars. They don’t need to be traveling at highway speeds to inflict serious damage to other vehicles and the people inside of them. According to one study commissioned by the National Highway Traffic Safety Administration, there are an estimated 30,000 injuries resulting from this type of semi truck accident each year in the United States. Of those, 3,000 are estimated to be considered serious or incapacitating injuries, and 171 are estimated to be fatal. These are nothing to be taken lightly. Semi-trucks, also called 18-wheelers or big rigs, are large, unwieldy vehicles. When operating these trucks in tight spaces such as cities and loading docks, passing traffic and pedestrians are at risk. It’s imperative that truckers are completely aware of their surroundings when backing. People in all vehicles should take extreme caution when they’re in reverse. That attentiveness should only increase for truckers, who are putting others at great risk when backing. Many trucking companies advocate for their drivers to follow the G.O.A.L. philosophy, an acronym that stands for “Get Out And Look.” Truck drivers who fail to ensure that their surroundings are clear put nearby drivers, pedestrians, and bicyclists at risk of being seriously injured or killed, for which the truck driver could presumably be held responsible. If a trucker is only focusing on one mirror, they aren't doing their job correctly. Looking at just one mirror creates blind spots to both the other side and rear of the semi-truck. The direct rear of a semi-truck is essentially always obscured, but paying attention to both mirrors gives the driver a complete picture. Location: A trucker backing in an industrial area that typically has little foot traffic might blame his accident on where it occurred. Reduced visibility: Semi-trucks are equipped with backup alarms – eliciting a distinctive “beep” sound to warn anyone around them they’re in reverse. Time of day: This goes together with the reduced visibility. Darkness makes pedestrians hard to spot, especially if they’re wearing dark clothing. Situational awareness: It’s reasonable to expect pedestrians or other vehicles to be cautious around a backing semi-truck, but not all parties can be blamed in an accident. For example, an elderly woman did not appear out of nowhere and put herself directly behind a semi-truck. It’s far more likely the trucker did not take the proper safety measures. When operating a vehicle in reverse you absolutely must take some extra precautions. By its very nature, you won’t be able to see as well when going backwards, which increases the danger significantly. In addition, most people won’t expect a vehicle to move backward unexpectedly, so they may not be ready to react. Audible alarm: Most large trucks and commercial vehicles are equipped with an audible alarm that activates automatically when in reverse. Inspect the area: Before backing up, it is a good idea for the driver to get out of the vehicle and manually inspect the area to ensure it is all clear. It only takes a moment and could save someone’s life. Get help: For commercial vehicles, especially in busy areas, consider having someone help you. Have them stand in the area to make sure nobody enters it while backing up. Make sure these “spotters” have a way to communicate with the driver in case someone does approach. Operating in reverse can be very dangerous, but when you take these and other precautions, you can avoid almost all risk of a struck-by incident. 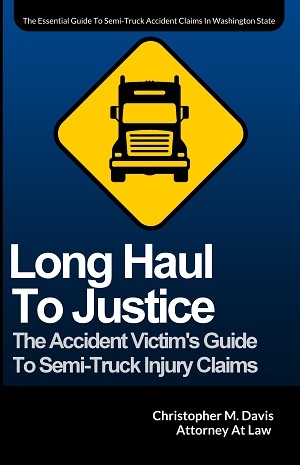 Injured In A Semi-Truck Backing Accident? 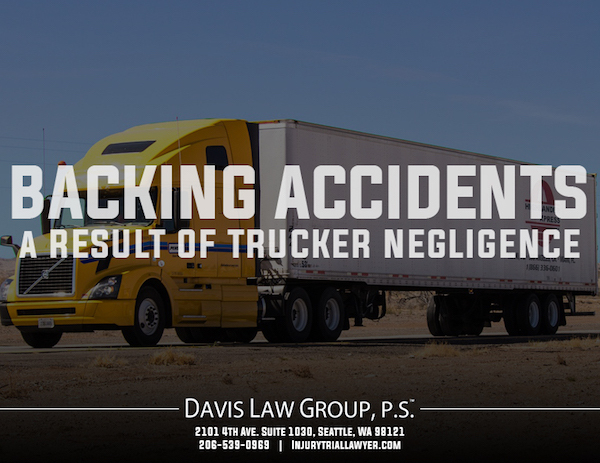 If you have been injured by a backing commercial vehicle, it may be in your best interest to consult with a trucking accident attorney with experience handling these types of cases. Attorney Chris Davis and the expert legal team at Davis Law Group, P.S., can help you navigate the complexities of these cases and get you the compensation you deserve. Call (206) 727-4000, use the chat feature below or fill out the contact form on this page to schedule a no-obligation case evaluation with us.